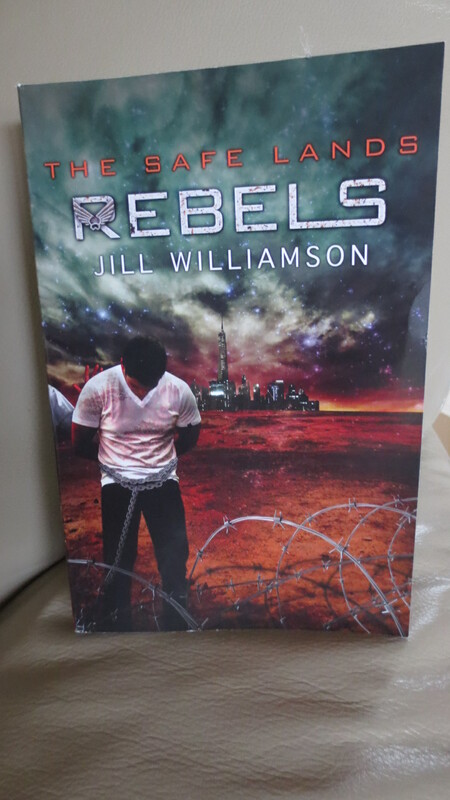 Rebels is book three of The Safe Lands series by Jill Williamson. (You can read my review of Outcasts, here.) The novels take place in a dystopian future where pleasure is promoted at the expense of real relationships and ethics. The heroes of the story are religious people from a patriarchal family where the men are always in charge and the women stay home to do laundry and homeschool children. The few instances where women step out on their own, something bad happens like they get captured. It’s like the antithesis of girl-power. Instead of a central protagonist, Rebels jumps around between three brothers: Levi, Mason and Omar, as well as two sisters: Jemma and Shaylinn. There are also a bunch of kids, kindred folk, city people, bad guys, criminals, medics and other characters to keep track of. Even though I was already familiar with the series, it was really hard to remember who everyone was. To add to the confusion, a few of the characters have two different names. On the plus side, Jill Williamson deserves a lot of credit for managing a very complex plot and tying up the threads neatly together at the end. At the two thirds mark of Rebels, I was wondering how the heck she was going to pull it off, and yet she did. The ending answers all questions, and provides a satisfactory conclusion. The only lingering concern I have is the book’s message that husbands are usually right and wives should do almost all of the housework. That type of future truly qualifies as dystopian! P.S. I received a free copy of this book from BookLook in exchange for my honest opinions and review.